Get ready for one of the biggest steps of your life, and a big adrenaline rush! Stepping back out over the towering descent of the Symonds Yat - some 125 feet. This will be a challenge to remember, and to be proud of! We shall equip you properly, and make sure you are briefed and trained in how to safely make the descent to the bottom of the Cliff. Meeting mid morning at Symonds Yat, we shall conduct a thorough briefing, get you equipped and suited in your safety harness and helmet. We shall then conduct our initial 'training' abseil' at a slightly lower level - to give you the opportunity to get the hang of things. Then, we set off to the 'big one'! It's certainly a long way down from here - and the abseil will take you quite a while to complete - with time to soak in your vertical surroundings. Make sure someone has got the camera ready for this one. Down on the ground you're going to have quite a smile on your face, as the happy adrenaline feel takes over! You will be briefed in the safety systems and techniques involved in abseiling, then we shall move on to our first challenge a 70 foot taster abseil. Here we shall test out the various techniques you will need to abseil, and you will taste the excitement of leaning back over a sheer vertical wall. In the afternoon you will climb up to the top of the Symonds Yat (about a 5 minute walk uphill!) where we will set up for the monster 140ft abseil. This is going to be fun! End of event - around 1pm - although this will depend upon numbers participating on the day. Failure to disclose medical conditions is a serious omission - that could have serious repercussions on any of our challenges. Your leader for the event is a qualified Rock Climbing and Abseiling Instructor. Adventure Café have risk assessed this event, and have taken industry best practice precautions to ensure that you are safe on this event. 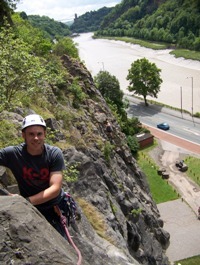 You will use 2 ropes - a main abseil rope and a safety back up rope. You will be securely anchored at the top of the abseil - to several strong anchor points providing full redundancy, to offer maximum safety and back up. All equipment is regularly inspected and is well within its recommended life span. This event can take place in the full range of weathers, and takes place outdoors - hence you need to be prepared for all possibilities! This event can be run from mid March through until end of October.